The phrase mid-century modern is something you have likely heard because it is seemingly all the buzz. This is understandable because as far as home styles go, it is pretty fantastic. What you may not realize is this type of look and many others were created, in large part, by a man named Frank Lloyd Wright. He was a talented and prolific architect/designer who could be considered the grandfather of many different interiors and architectural styles–as relevant today as they were in the late 19th and early 20th centuries when he lived. 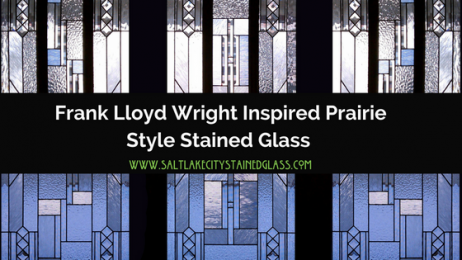 His curiously ubiquitous Prairie Style philosophy was his passion and today it is still one of the most popular stained glass styles on the market. Read below to find out why. 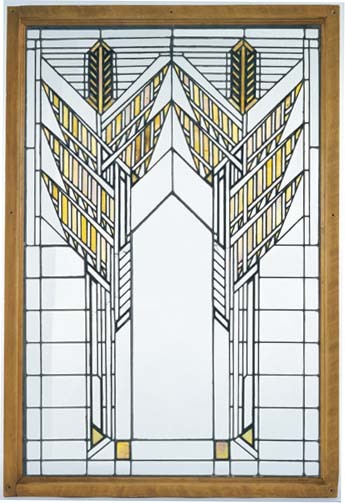 What Exactly Is Prairie Style Stained Glass? When you think about a prairie landscape you probably imagine endless fields and sharp horizon lines stretching on for miles and miles. This type of expanse filled full of light and openness is exactly the type of feel Wright wanted in his architecture and stained glass. Dramatic horizontal lines that crisscross but blend into the worlds outside and inside are strong hallmarks of Wright’s work. He was enchanted with how light entered a room and considered it, as well as the glass, a part of the design of the house itself. He was incredibly concerned about the integrity of the materials he used, from stone to glass and everything in between. This meant he did not want to disguise the glass but rather allow the glass to exist as itself in an environment. Similarly, he wanted everything he designed in the Prairie Style to harmonize with a natural setting. The results from Wright in this and many other styles were amazing. His work was modern at the time, but somehow had echoes of a simpler, more natural time; just as at home in the natural world as it would be in a city setting. And in an urban setting, the echoes of nature were unmistakable. His use of colors as accents and penchant towards mixing them with mostly clear glass and intersecting lines allowed his prairie style work to be both outstanding but still at peace the natural world all around. To say Frank Lloyd Wright was ahead of his time is, in fact, an understatement, but the uniqueness and breadth of his work, leave the viewer to believe no matter what era he lived in he would still be a pioneer of his day.